Professor Alexander Arguelles, possibly the world’s most famous hyperpolyglot, has chosen to mark Assimil’s 90th birthday in his own way. In this exclusive piece, he explains why Assimil is the best language-learning method available. 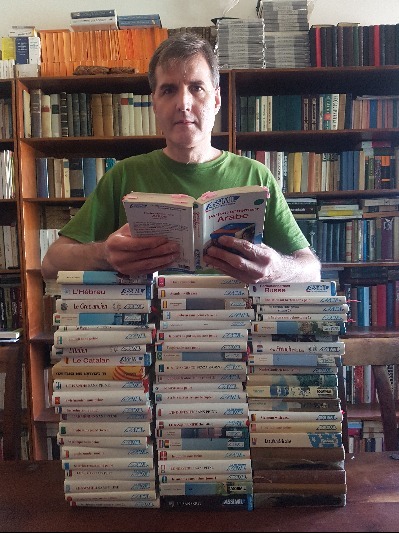 He has used it to learn more than 20 languages – so far! Assimil courses are without any doubt the single most important ingredient in making me the polyglot I am today. Without them, I would still be a polyglot — I was, after all, already a polyglot when I first encountered them. However, I would probably not have the range of languages that I now have and, more importantly, I would not have been able to develop my own, most efficacious means of studying, namely shadowing, without them. Moreover, I would not have the same insight into the entire language learning process that I have attained thanks to them. What is it that makes Assimil courses a polyglot’s best friend? 1) The first is the inherent excellence of the bilingual text method and the fact that Assimil is the only method that makes full use of it. True, Linguaphone did so as well, but generally with separate volumes and not on facing pages. The bilingual text method is the most logical and satisfying way of learning a language, that is, by comparing word for word, line by line, a text in a new language with a text in one you know already. This allows for the greatest degree of intuition and actual learning by recognition making links and associations on one’s own. 2) The second factor is the quality of the recorded material. For one thing, Assimil is the only method that makes full use of target language only recordings. In order to use the recorded materials from any other methods, I have always had to edit them extensively, cutting out all the teaching language, long periods of silence, and unnecessary music. Many other methods may claim to provide many hours of recorded material, but when edited down to target language only, they often contain less than a single hour of useful target language content. With Assimil, howevever, it is only sometimes necessary to edit out occasional too-long gaps between sentences, such that the actual length of the recordings is quite close to the time listed. Furthermore, the quality of the voices on Assimil methods is head and shoulders above that of any other method. Assimil clearly uses actors and actress chosen for the quality of their voices, and has them record in sound proof studios. Many other methods use speakers whose voices are less than optimal,and seem to think that it is « realistic » to offer listening material with distracting and distorting background noise. When learning a foreign language, quality of recorded material is critical, and in this regard no other series of methods can compete with Assimil. 3) The third factor is the conscious parallel structure of individual Assimil courses with others in the series, and of cross referencing between them. This feature is one that pertained more to past generations of Assimil methods than to the current generation, but I hope that the company will consider stressing this again – together with the song every 7th lesson — in future generations. When you have taught yourself a language with one autodidactic method and then embark upon another language using a course whose content is largely parallel to the first one, this makes it much easier to learn, even if the languages themselves are not related. 4) The fourth factor is the uniform format for the whole series. The fact that all Assimil books are the same shape and size and color, just as the cases that contain their recorded materials can all lineup together to form a veritable collection — all of this appeals to the mind of a polyglot. Being a polygot means, in point of fact, being a collector of languages, and what could be better than to have a veritable collection of perfectly balanced and harmonious physical manifestions of the langauges you know than a set of shelves filled with beautifully balanced and uniform Assimil volumes? There is something compulsive in a polyglot’s nature, and having a physical Assimil collection is a great impulse and stimulous to study their content. 5) The fifth factor is a practical one related to the fourth one, namely the fact that the size of Assimil volumes is not only aesthetically pleasing in their collectability, but of great practicality as well. In the case of Assimil and Assimil alone, the term « manual » means not only a textbook, but also something that fits perfectly in the hand. And indeed, the shape, heft, and feel of an Assimil volume is one that fits pefectly within one’s hand. This is no small matter. Studying hard enough to become a polyglot means carrying your study material with you wherever you go and studying during every spare moment that you can beg, buy, borrow, or steal. Doing this is far easier with Assimil manuals than with any other series. 6) All of the above factors combined to enable me to use Assimil courses to develop my technique of learning a language by shadowing it until I had internalized a representative sample of its content. I will describe this process in more detail in my next post.